Normally I wouldn't think anything unusual of throwing together a salad like this. It's what's for lunch quite regularly. Only lately I've served it up to a few friends/family and they seem to think it is out of this world good. Me? I'm thinking not only is it ordinary it is very easy to put together. Many of the ingredients come right from the garden which is what delights the taste buds so. Sorry. I have no measurements (which is how I cook, too) but I'm going to share the list of ingredients ... just for those of you who might want to put together the same combination. Or for those of you that might just need a little inspiration to get out a sharp knife and start chopping away at a healthy meal. You will just have to "feel" your way through the proportions like I do. And have your own fun adding more of your favorites to it or whatever is in your garden. I'm warning you though. You won't want another salad once you taste this one. Squeeze a half of fresh lemon and salt and pepper to taste... or not. Add your choice of dressing or eat it without. I'll take a big plate of that salad, it looks delicious. I'm just now harvesting the first lettuce from my garden. Yummy! This sounds heavenly. Yummmm. I will have to try it. I thought of you today when I bought the caladiums for my window box. I will post a picture when I get them planted. Cheers. I make something similar with craisins, apples, chicken, onion, walnuts, goat cheese, strawberries, on a bed of fresh spinach or spring mix and seasonsed with raspberry hazelnut vinaigrette dressing. So perfect for these summery days. that does look and sound amazing. you know me and fruit in any salad. yummy! i will be trying this as soon as i have some of these same things grown from our garden. i didn't cook tonight i had a bowl of smart start/toast/strawberries but your salad would have been preferred. Sounds wonderful. A coworker makes and amazing fruit salsa. 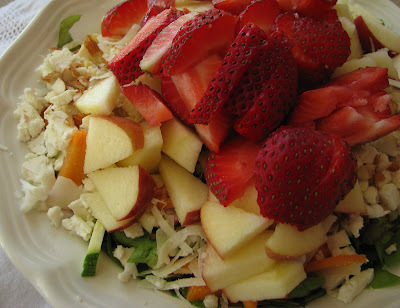 OMGosh, this salad sounds mouthwatering and the photo is marvelous. I think I'll copy and paste your recipe. Thanks for sharing. Looks delicious!! And to think most of all that good-ness comes from your garden! Meems, I love the recipe! Just a little extra virgin olive oil and a fine Vincotto aged vinegar and I would be very happy! Hope you're doing well? It sounds wonderful. I make something similar only I used celery instead of radishes, pecans pieces instead of almonds and butter crunch lettuce. Whatever's in the garden and in the pantry, right. I was given some wild strawberry plants this spring. Can't wait to eat the first. This will definitely be tried at the G3 homestead, looks delicious!! Thank you - each and every one for your responses. I read each one and lover to hear from each of you. It is so interestingn to hear your variations. With this particular salad ---it's all in the chopping, my friends.